Europa is the ideal hardware sequencing solution for your MIDI-equipped drum machines and synths. 17-track MIDI step sequencer and drum computer. TR-808/606-style programming. Clock and trigger outputs for interfacing with analogue gear. Biased towards MIDI. Not quite 'one function per key'. 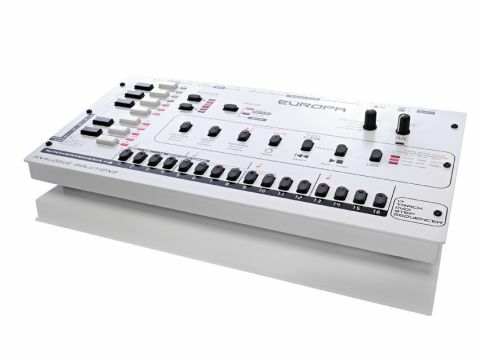 The Europa is a TR-style MIDI step sequencer and drum computer with support for up to 17 tracks and a number of clever features for live editing and syncing with other equipment. Analogue Solutions already makes a 16-step sequencer, the Oberkorn, but the Europa shouldn't be mistaken for a replacement, as it focuses very heavily on MIDI control rather than sending CV and gate signals. The Europa is much simpler to operate than most of its rivals, and a quick scan of the very comprehensive manual is all it takes to get started. That said, Analogue Solutions' claim that the device operates on a 'one function per key' basis is ever so slightly misleading given that a number of keys have different functions depending on what mode you're in. Some also change function depending on whether the machine is playing or stopped. Nevertheless, operation is still simple. To start sequencing, just select a pattern, set its length, choose a MIDI channel and you're ready to go. We started with the Europa's note mode, designed for sending a monophonic signal to synths. In note edit mode, each step of the sequence is selected before entering a note using the one-octave vertical keyboard on the left side of the Europa. Once the notes are programmed, the Edit button can be used to adjust velocity and legato for each step. Polyphonic patterns aren't possible via note tracks, but it is possible to assign multiple tracks to the same MIDI channel, allowing polyphonic sequences to be created. In drum mode, the Europa sends polyphonic MIDI or trigger signals for control of drum machines, controlling a maximum of 12 drums. Each drum is assigned to one of the keys on the mini keyboard and the MIDI note transmitted by each key can be customised globally to match your drum machine. Accent and flam for each step may also be programmed. "The Europa is much simpler to operate than most of its rivals, and a quick scan of the very comprehensive manual is all it takes to get started." Overall, it's a simple but effective system and it didn't take long at all before we were comfortable with programming the Europa. The Europa really starts to show off its power when you begin piecing together song arrangements from your patterns. The basic functions are supplemented by a number of more advanced features which make it even more versatile. Stepping out of edit mode and with the sequence playing, it's easy to adjust your sequences on the fly, shifting patterns by whole octaves, transposing by a selected number of notes, or muting individual notes and drums. With the sequencer stopped, it's also possible to adjust swing in twelve increments from 50% (ie, totally straight) to a whopping 97.5%. In practice I found the higher settings too extreme for most uses, but it's great to have such a wide range to choose from. The way you use the Europa will depend to a large extent on what type of gear you need to control. While the Oberkorn is intended to trigger synths via CV and gate signals, the Europa is clearly aimed primarily at MIDI users, with no CV outputs, but the seven trigger outputs ensure that it will also play nicely with analogue gear. Triggers can be programmed in order to control drum modules, act as gate signals or even trigger other sequencers. The possibilities here are huge, especially if you hook it up to a modular synth setup. To keep the timing rock solid, the Europa can sync to an external MIDI clock, a trigger signal or its own internal clock generator. The clock sync signal can also be sent back out of the device to other equipment for timing purposes or as a synced square wave LFO. It's a flexible setup which ensures analogue fans don't need to fear the Europa's MIDI bias. The market for dedicated hardware sequencers is small but hotly contested by a handful of specialist manufacturers. Triggering mono synths, drum machines and even poly synths from the Europa makes you appreciate the step-based approach. Programming 808-style drum loops, acid patterns, Moroder-esque basslines and techno riffs really shows off the immediacy of the workflow. The Europa's flexible approach and its advanced MIDI capabilities make it a great hardware MIDI sequencer, and the fact that it's cheaper than most of its rivals only makes it more appealing.